COMMENTARY – What’s in a term? I contend, a lot. We now use the term stay-at-home-mom instead of a term like housewife. Does housewife seem dated? Perhaps. But notice the shift. Wife connotes a relationship with her husband while stay-at-home-mom connotes a relationship with her children. I don’t like to get all caught up in semantics, but this mirrors a societal shift in focus that is a major part of the problem modern families face. Sure, there were many who did not relish the role of housewife. However, in forging new acceptable roles, the term became one of ridicule, driving others away from choosing the role of housewife. And the critics, with their valid criticisms about how being housewife can be limiting, can’t acknowledge the way in which that role contributes to a healthy family and in turn, the society at large. There is ample evidence that many women still wish to choose to be at home, raising and nurturing a family. Yet, because of how housewife has been undermined, they are reluctant to claim the very role they desire. We have chosen a new name, stay-at-home-mom and reduced the duties of the role and expectations. In the process, we have become far more child centered, and because of this, the main support relationships for children are floundering. If we’re going to replace the term housewife, then I prefer the term primary domestic. It’s important not to make this designation gender specific. In my columns you will see the following terms used to help define roles in relationship. I have found that men are generally sympathetic to the issues women have with the old gender roles. However, when men seek to contribute to the discussion to change roles or wipe the slate clean and divvy them up differently, there is a reluctance from women to replace them or pick a different role in relationship and then stick with it. So, before we get much further into bringing up past grievances of old roles and current grievances with current roles, we need a set of terms that accurately reflect the ideal we are seeking in a modern world: to be able to choose our roles, not have them handed to us. This is an acknowledgement to the importance of the old role of housewife and that of each individual and family to choose or re-arrange roles so that career aspirations, personal growth and the wellbeing of the child and family find an easy and uncomplicated balance, without being subject to ostracization from either side for the choices they make. Hopefully, we can jettison some of our baggage. 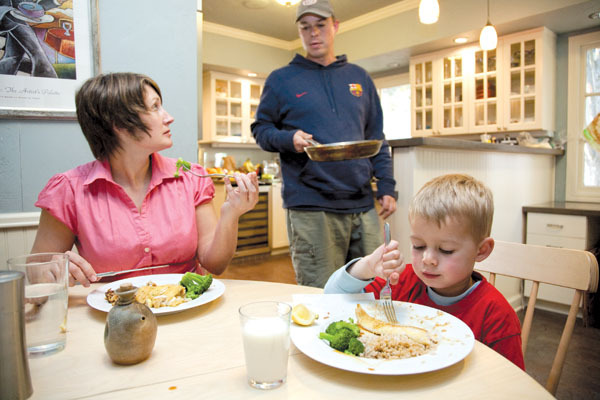 primary breadwinner: Their job is the main focus when priorities regarding family income are concerned. This does not mean the primary breadwinner is absent on the domestic front. sole breadwinner: This term acknowledges the stress of being the only source of income and that they also need to contribute to the domestic side. Please note there is no sole domestic listed here. For the sake of relationship, the sole domestic has got to have other things defining them besides family and children. primary domestic: Acknowledges that the role includes more than childcare such as the function of the household and managing the budget but does not make assumption to income outside. If the primary domestic has earnings as well, that income and position generally is second to the primary breadwinner’s job in terms of structuring priorities. equal earners: Has it’s own set of issues. What if things pencil out pretty even, and both are working full time? unequal earners: Suggest both are full time, but there’s a significant gap. single parent: Is a term that should be used carefully, if at all. I am single and I am a parent. But I do not parent alone. absent parent: Let’s be honest, there are no-shows. the home in progress: Refers to the habits and rituals of a home and family. It is important for each partner to be aware of the bio-biorhythms of each other and to actively cultivate the family’s bio-rythemns. It is important to have these discussions before creating a family. They are often not given much thought. And, when one is in charge, s/he must be attentive to the desires of the absent parent. And when that parent returns back into the home, they should be sensitive to rejoining the home in progress, both in not trampling over what is going on, and in giving relief. This entry was posted on April 18, 2013 by A.J. Simonsen in commentary and tagged breadwinner, commentary, parenting, primary domestic, stay-at-home mom.